Denny Jump (Bellevue, WA, United States) on 26 August 2012 in Lifestyle & Culture. 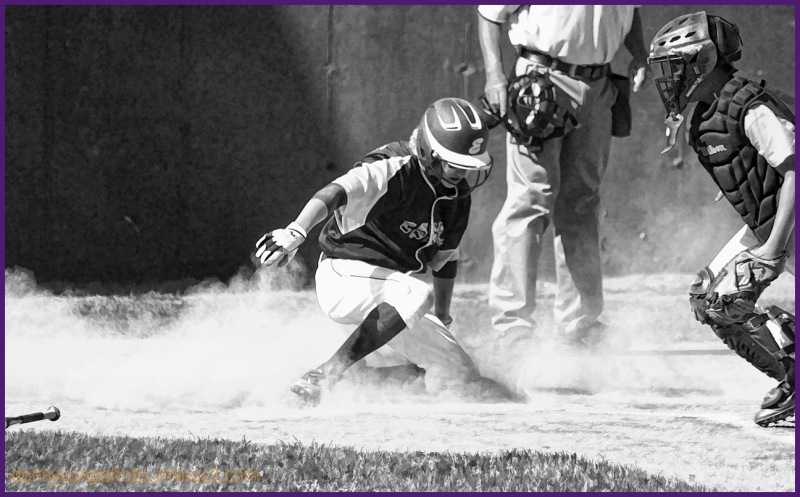 I captured the "Original" of this shot of Tyler almost 6 weeks ago, but following the end of the season, I wanted to display this image of him sliding into home plate, and thereby scoring a run, in an All Star Playoff Game. I processed this image in "Topaz B&W Effects- Simplify" mode, which actually removes detail and casts somewhat of a watercolour effect. I was rather pleased with it. Please let me know how you like it. And finally, I wanted to sound my trumpet one last time....Not about our own grandkids, but, instead, about Little League Baseball which is actually an international organization.There are teams from all around the world, such as the team from Uganda whom Barbara and I had the privelage to see frecently in Williamsport, PA. Their story, about how they got here, is so touching and emotional. The International Little League Organization is truly focused on good will, comraderie, and most of all, good sportsmanship.There are many so-called Professionals, who could take more than one lesson, in that regard, from these 11 and 12 year old kids. Really evocative shot, the b & w is perfect, as is your capturing the moment. Fab! Terrific monochrome image, and I agree with you some of the so called professionals in all sports could take a lesson and also remember how much they can influence these kids too. Fantastic action shot! I love all the dust! Wonderful! I love this shot. Lots of vivid action frozen in time, and it looks very good. Yes, applause for the Little League. Really wonderful action shot, Denny. Love the simplicity of it in b/w to show the action! brilliant action shot and cracking presentation! congrats to your talented grandson, and hats off to you sir for your outspoken words about the world of sports! i couldn't agree more (though here it's more about soccer and skiing than anything else)! I am happy you have had a good experience with the Little League organization; we did not. We pulled our boys out due to the unending foul language from parents in the bleachers. It was a negative experience. We moved on to the local soccer league and our boys eventually got to meet Pelé. ... Sorry, Denny; I didn't want to sound negative, but I'm happy that you have seen a different side than we did in CT. This is an excellent image. Nice capture of the action and really fine tonal range throughout the image. Great action shot, Denny, and interesting info about Little League.